What is Trauma insurance (or Critical Illness insurance)? What is covered by Trauma insurance? Trauma insurance cover (also known as Critical Illness insurance cover) provides a cash lump sum on the diagnosis of a medical condition. The number of conditions covered (benefits) varies widely, cheaper policies often offering fewer benefits. The most common claims under trauma insurance policies are for: cancer, heart attack, coronary bypass and stroke, although other conditions can be covered. Unlike life insurance, a trauma insurance benefit is paid when there is a confirmed diagnosis – not when you die of the condition. With the latest statistics from the Cancer Council Australia showing that 68% of cancer patients survive for more than 5 years, trauma cover provides you and your family with a lump cash sum to use at the onset of a disease, when funds are needed the most. Why do I need Trauma insurance (Critical Illness insurance) cover? Trauma Insurance was first introduced into Australia in 1986 when it was recognised that a critical illness (trauma) could have a damaging impact on the finances of an individual or family. Medical bills from a long lasting illness could cause severe financial hardship, particularly if you have limited savings or heavy debts. Financial stress could inhibit your recovery by forcing an early return to work or limiting your treatment options. Is Trauma insurance cover only for old people? 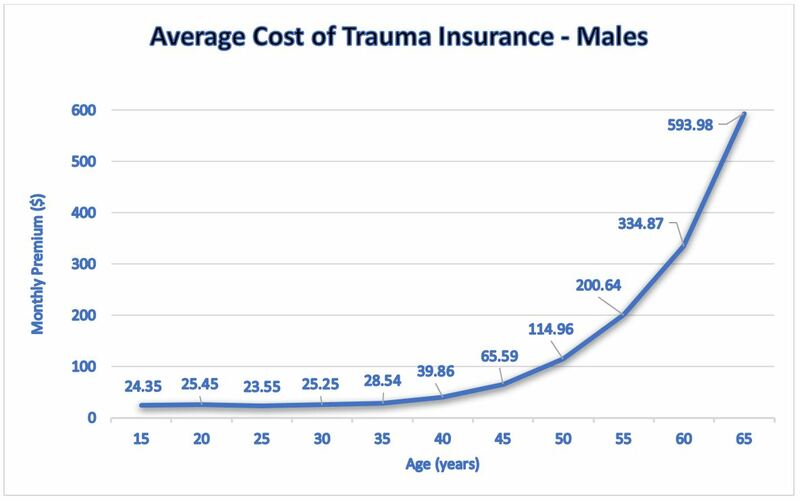 Trauma insurance is relevant no matter your age. For the over 40s the increasing risk of cancer, heart attack and stroke is obvious. For younger age groups trauma insurance provides cover for accident related trauma conditions, particularly those resulting from car accidents, such as paralysis, major head trauma, severe burns, loss of limbs, loss of sight and coma. There are also neurological conditions such as multiple sclerosis and cancers such as breast cancer, lymphomas and melanomas which can afflict younger people. 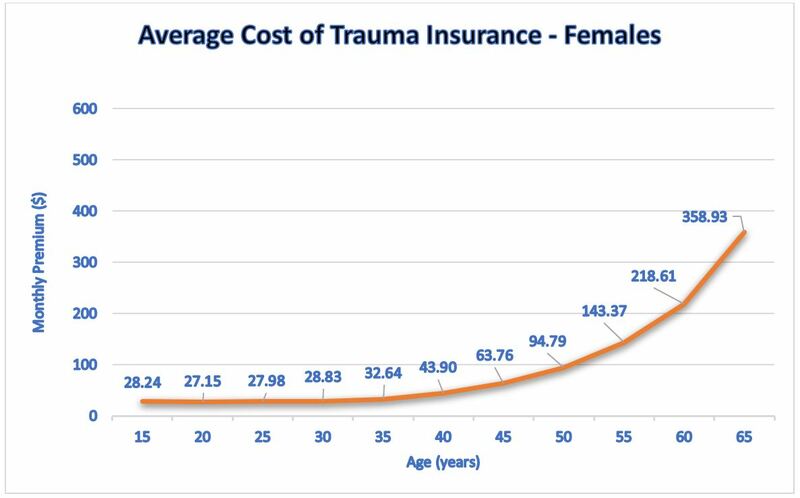 The graphs below show how the average trauma insurance premiums for males and females increase with age (for stepped premiums). The monthly premiums shown above are for $100,000 standalone trauma cover taken out by a non smoker in Victoria as at 24th October 2018. They are the average stepped premiums from the companies compared by Insurance Watch – AIA, AMP, Asteron, BT, ClearView, CommInsure, MLC, OnePath, TAL and Zurich. The graphs show that premiums increase rapidly above the age of 50 as the likelihood of claiming increases. Female premiums tend to be more expensive than males before the age of 40, after which male premiums tend to be higher (reflecting the incidence of heart disease and mortality rates). Premiums for smokers can be up to 100% higher, in recognition of their higher risk profile. Level to age 65 premiums are also available on request. Level premiums will initially be higher than stepped premiums but can provide significant savings if the policy is kept to age 65. The size of the savings is usually larger the younger the age when the policy is taken out. The cost of trauma cover will usually also depend on the number and type of conditions covered. Most insurance companies offer two tiers of trauma cover – basic/standard and comprehensive/plus. The main differences between these two types of policy is the number of full benefit trauma conditions covered (which can range from 5 to 50) and how many partial trauma benefits are included. Partial trauma benefits can pay a benefit of between 10% and 40% of the sum insured for conditions which are less serious or life-threatening, such as an early stage melanoma or carcinoma not requiring major medical treatment. If you are paid a partial benefit this will reduce your trauma sum insured. The remaining sum insured would be paid if your condition worsened, i.e. if your early stage cancer became malignant, or you suffered another unrelated trauma condition. Another factor affecting the cost of trauma cover is whether life insurance cover is included or not. A standalone trauma policy will only pay a benefit if you survive for a given period after suffering the trauma condition, usually 14 days. If you die within this period you will not receive a payout, unless you also have death cover. You might therefore expect the cost to be higher if death cover is included in your policy. However, due to a quirk in the way stamp duty is currently applied in some states, standalone trauma cover can in fact cost MORE not less than trauma cover with death cover included. This is why Insurance Watch allows you to compare quotes for trauma policies with and without life cover side by side, so you can see whether premiums are increased or decreased by adding life cover. Premiums vary widely between insurance companies so it pays to shop around for your trauma insurance cover. As an example, for a 40 year old male non smoker looking for $100,000 trauma insurance, monthly premiums for the insurers we compare varied between $29.69 and $54.09 (as at 24th October 2018). Insurance Watch compares quotes for over 40 trauma insurance policies from over 10 different insurance companies so Compare Trauma Quotes Online now. How is Trauma insurance different to TPD insurance and Income Protection? The disadvantage of Trauma insurance is that it only covers the specified conditions under the policy. 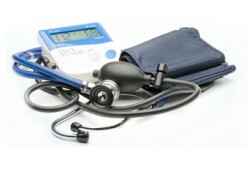 It does not cover all illnesses or accidents. There are a number of medical conditions which may prevent you from working, such as stress, RSI or back pain, which will not be covered by your trauma policy. Total and Permanent Disablement (TPD) insurance and Income protection insurance on the other hand will usually cover any sickness or injury which causes you to be unable to work. However these covers also have their disadvantages. TPD insurance requires you to have been off work for at least three months and then judged to have a permanent disability such that you are unlikely to work again. Income protection insurance does not provide a lump sum and the monthly benefit you receive will only cover 75% of your income which could mean that you will struggle to meet medical costs. Including trauma insurance in an insurance package will provide valuable funds to meet medical costs when they are most needed – at the time of diagnosis. If you are not working, performing home duties or working in a high risk occupation you may find that work based TPD and income protection are not available to you, making trauma and life insurance your only insurance options. Will my Trauma insurance claim be paid? Total claims paid by life insurers in the year ending 30 June 2016 amounted to $8.2 billion according to data from APRA. A review by ASIC in 2016 found that on average approximately 90% of all claims submitted were paid – of these 86% of Trauma insurance claims were paid. The main reasons for declined claims were non-disclosure at time of application and ineligibility due to policy definitions, limitations, exclusions or pre-existing conditions. Trauma insurance claims statistics show that 50% to 60% of trauma claims are for cancer, the most dominant types being breast cancer for women and prostate cancer for men. Cardiovascular conditions such as heart attack and stroke also comprise a large share of overall claims. We have also used recent claims data released by ASIC and APRA to highlight the trauma claims performance of individual insurance companies. To understand how trauma cover can make a difference watch our moving videos of real life Trauma Insurance Claims Stories or read Trauma Insurance Reviews from current policyholders. If you have taken out a trauma insurance policy through Insurance Watch and you need to make a claim we will help you during the claims process. Some trauma policies also include a Death benefit, which will have the same pay out value as the trauma benefit. In this case, obviously, only ONE pay out will be made – either on a trauma or on death. There may be savings available in buying life cover as part of a trauma package rather than as a stand alone policy. Some trauma policies also cover Total and Permanent Disability (TPD). When packaging benefits in this way you should be aware that a claim on trauma or TPD will reduce the underlying life cover unless a buy back option is purchased. Normally only ONE trauma benefit is ever payable to an individual under a policy – after a pay out you may become uninsurable and no longer able to buy Life insurance, Total and Permanent Disability, Trauma or Income Protection insurance cover from any insurer. So it is important to either purchase a buy back option or have sufficient cover to enable you to live out your remaining life on the proceeds of the claim. Buy back options are offered on some policies for an extra cost while others automatically include a buy back option. If you have the option, you may, after a qualifying period, usually 12 months after the benefit payment, re-purchase the death cover component. There is also a trauma reinstatement option available which will allow your trauma cover to be reinstated (for conditions other than that claimed on) after a qualifying period of 12 months following your claim. When looking for a trauma policy, you will be confronted with a variety of conditions covered by the policy. However four of these conditions account for the great majority of claims – cancer, heart attack, coronary artery disease and bypass surgery and stroke. Therefore it is the definitions of these top four conditions within the policy which should be carefully scrutinized. While increasing the number of conditions covered increases the likelihood of an illness being covered by the policy, the additional conditions will usually come at the cost of an increased premium. Read carefully the exclusions and other conditions for the traumas covered. Pre-existing conditions must be declared. Conditions caused by intentional self inflicted injury are usually excluded. In most cases “accidental” types of traumas are covered immediately, although many insurers impose a waiting period (commonly 90 days after the policy is accepted) for certain illnesses eg cancer, stroke, heart attack. This is particularly important when changing or replacing policies as you may not be covered during the waiting period on the new policy for certain conditions.